has nestled into a soft place in my heart. created specifically for one another. And soon we begin on an intensive teacher training journey together in IGNITE. I have already learned so much about sinking more fully into my spirit from this woman. I was taught that people who have been wounded in their lives carry a healing gift. They carry a gift for healing.... and through this journey that we take finding our way back to ourselves, expressing this gift is how we heal ourselves. It is the healing gift that we offer to others, those who find a resonance with our story. I believe a healing gift is the way we express Divine Source. And it is unique for everyone. The gifts that each of us are given, is how we express the Divine. That thing that makes us come alive, is our gift. The essence of what is a gift...a gift is something that was given to you by the Divine Creator. It comes from within us. And in honor of this gift, we share it, and it fills us, for the good of all. And so these gifts are in essence healing, because they connect us to our Source. The Source of Life in the Universe, the Divine energy that is present in all living beings, in all things. I was taught in a way of the Shaman's world that when you are wounded or initiated or put through some trial, that it is through that experience of finding your way back to yourself that you offer a healing path to show others. It is not that you show others the way, it's that you share the way you traveled. You share what you experienced and through this witnessing process, this mirroring process, others connect with their own gifts from Divine Source, and when you are connected, you are whole. For me, artist and healer are intertwined. I have been on a path of being a healer for many years. And the healing gift that I have brought has been my music, has been my art, and how I feel deeply connected to the Divine Earth. I feel vibrantly beautifully wonderfully alive when I express through music, through singing, through channeling the Divine energy that comes through my unique voice, and through my hands. I don't talk about myself as a healer so much anymore. I’ve struggled with the title of healer, (but not the role…) for most of my life. And most of that struggle has come from being afraid to fully own and outwardly claim that I hold a powerful gift. It is my true gift to hold a powerful light in the world and let it shine out. But when you know it, trust it and allow for your honest expression, LOVE takes care of the rest. I have come to believe that if we all could admit to ourselves how powerful we truly are, own it without shame or fear of being judged audacious for shining as bright as we really are, the journey would be more of an adventure, less of a battle and bring enormous amounts of healing presence to us all. 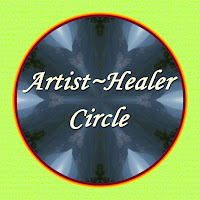 It wasn’t until quite recently that I discovered that artist and healer were the same vibration for me. I had had them separate in my mind. My longing to express myself as a visual artist became a lived passion for me when I began my work as an intuitive painter utilizing my deeply honed skills and abilities of mediumship and intuition that I have always relied upon in my practice as a healer. The “Healer Goddess” painting you see above, was a huge portal for the remembering of how artist and healer intertwined are my true legacy. The ancestors continue to speak through this painting to me as I paint in my studio. And from this remembering emerges my true soul's path: to express Divine Creation through my art. Sharing the joy and Oneness I feel when I experience Nature, through my art, and my music, is my life purpose. That is my soul’s message, expressing what the Divine wants me to express. And it has a healing effect on myself and on other beings that live here on this beautiful Earth. I received a message from the Earth long ago, she said, ”Tell the world how much you Love me. That is your reason for being here.” In joy and vibrancy, I say YES to myself as an artist and healer. I choose to honor the Earth, to honor the sacred wisdom that flows through every living being by living my soul’s dream. I am living the dream of my Artist Soul. A lot of my art brings forth images of my healing helping allies, the Trees , the Stone People, the Animal Spirits, the Elements. These Beings and these Spirits Beings want to be seen, they want to be felt and they want to be heard. What better way to spread their voices in the world but to paint them and to sing them. To share them. 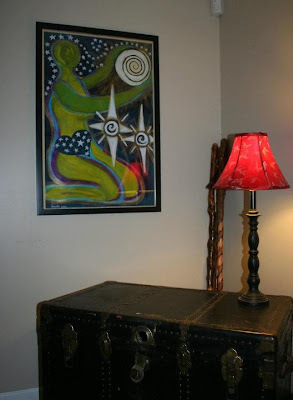 The two Paintings above, painted at the same time as the “Healer Goddess,” were breakthroughs in my process of weaving artist and shaman back together into my life. This process allowed for my authentic self expression to take center stage. The voices of the ancestors reminded me of my legacy. I am a shaman’s healer. I am a shaman’s artist. This song fell from a portal in the sky into my lap, or should I say unto my bivouac sack as I lay quietly under the stars, on night 3 of my solo vision quest in the desert mountains of eastern Washington, Summer Solstice year 2005. I had been praying for a vision to guide my life, my practice as an apprentice to the Spirits, visiting the wild desert land of the region in which I have made my home since arriving upon the sands of the Great Mother Herself. I had chosen to sleep on the third night, instead of staying up all night praying, I asked to be shown what I needed to know in the Dreamtime. I awoke in the blackness, greeted by the stars, a large triangular constellation began speaking to me. When the voice continued for more than two sentences I realized this was what I had been longing for….. scrambling for the small notepad and pencil stub that was stashed under the corner of my ground tarp, in the darkness I scratched onto the page, the voices of a people echoing the wisdom from Stars to Earth. With this message came a flow of light so brilliantly blue, resonating my heart and my hands. My heart and my body filled with gratitude, I knew I had been given the gift of a lifetime. A song. A vision. I would not leave the desert empty handed, and so I must give this gift, from the Star People, to the Earth People.